Mugen (say “moo-ghen”), which basically means “unlimited” in Japanese, is one of the better-known JDM tuner companies has been making performance parts for Hondas for decades. Body kits too, as you can see, for better or worse. 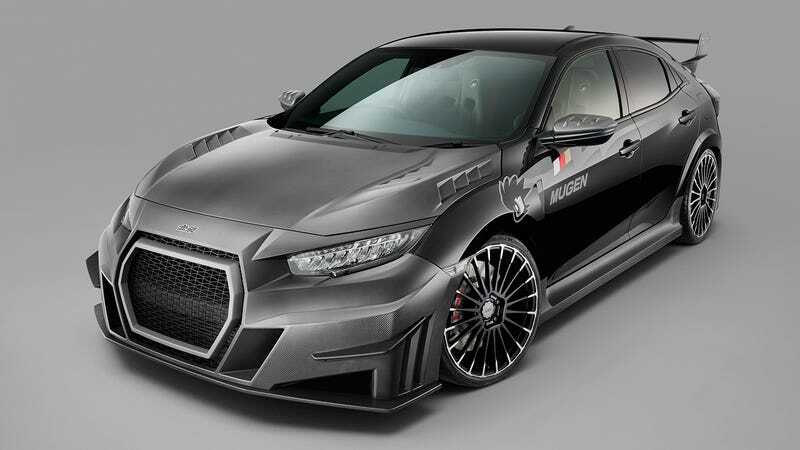 What you’re looking at here is being described as “a matured pre-preproduction model of the “Mugen RC20GT Civic Type R concept” exhibited at 2018 Tokyo Auto Salon” in the company’s press release. Do you remember the first iteration of this monstrosity from last year? I didn’t, but now that I know Mugen had 12 whole months to sit down and think about what they’d done, I’m even more shocked that we’re looking at it again. As for real-world feasibility, “pre-preproduction” sounds pretty nebulous so I wouldn’t worry too much about seeing one of these sneak up on you at a stoplight anytime soon. Maybe we’ll just get the preproduction version next year. My initial reaction was visceral disgust but now that I’ve been looking at it for a few minutes I’m already kind of starting to see the appeal of the perverted Audi/Gumpert Apollo face treatment. Kind of. The biplane back wing and squared-off rear bumper though, I will never understand. Mugen has stated that the RC20GT will be “the ultimate Type R” with enhanced power and cooling performance to back up its ridiculous design, but we’ll reserve judgment on that until somebody gets to drive one hard. In addition to this vengeful alien-looking space Civic, Mugen is showing off tuner parts for the Insight, CR-V, NSX, much more low-key treatment for the Civic, and something particularly delightful called the N-Van which might deserve its own blog. Stay tuned.